RCF USA presents the Quest Marketing team with the Arturo Vicari Award of Excellence as Rep of the Year. Quest Marketing, RCF USA manufacturer representative for the Southeast region of the United States, was recently presented with the Arturo Vicari Award of Excellence as Rep of the Year. 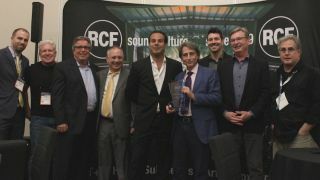 The award, named on behalf of the Italian-based RCF Group CEO Arturo Vicari, is presented to the rep firm with the best sales performance and most professional presentation of the company’s products. Quest covers the Southeast U.S. market including Florida, Georgia, North and South Carolina, Tennessee, Alabama, and Mississippi. Vicari took over the leadership reins of RCF in 1996 and has transformed the company from a component manufacturer to a pioneer in the evolution of the portable speaker system, and now offers a wide array of systems integration products and is a worldwide provider of live sound reinforcement. RCF USA is the wholly owned distributor of RCF for the RCF Group in the United States. “To be recognized like this is such an honor,” said John Saviano, principal, Quest Marketing. “Quest Marketing is proud to be associated with RCF. There is not another company in our industry that makes you feel so much like part of the family—maybe that’s why we’ve been successful. In addition to Quest being honored with the Arturo Vicari Award of Excellence, Quest sales representative Matt Pogorelc was named RCF Rep of the Year. “And to have one of the Quest team receiving another award makes it even better,” Saviano said.